NATURE LOVERS' AND SPORTSMAN'S PARADISE! This John Cotner designed and Clayton Buchanan built custom ALL BRICK, TWO STORY COLONIAL offers over 600 ft of DEEP WATER ACCESS, RARE PRIVACY and PRIVATE BOAT HOUSE with electric boat & jet ski lifts, dock and floating dock! 650' wooden walkway (w/lighting) leads to a treehouse ( elec. & window AC ). 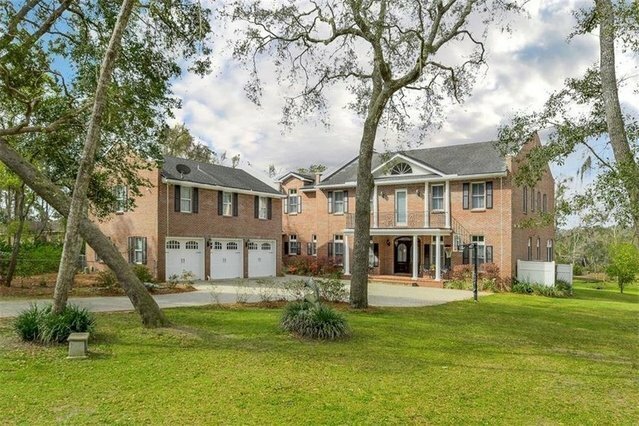 Home feature BRAZILIAN MAHOGANY FLOORS throughout, except for wet areas, 4 HVAC's, 2 fireplaces plumbed for gas, central vacuum system, laundry shute from master bath, Anderson windows and doors, study features knotty pine paneling & custom book shelves. Wired for whole house generator, well pump & softener housed in matching brick enclosure. Spacious master features adjoining sitting room & fireplace. Plumbed for Summer Kitchen. This unique lot and deep water frontage make this home TRULY SPECIAL! Swarovski crystal chandelier is negotiable. Credit for new oven to be issued at closing. Please remove shoes prior to showing or don booties prior to viewing home. Feature sheet, floor plans and survey in Doc Mgr. For questions / offer, please contact Kathy Garland @ 904-556-5744.